You have to stop every three hours to fill up the tank, whether you’re driving or not. There’s only one warning light on the dash. It’s blindingly bright and offers no information about what’s wrong. 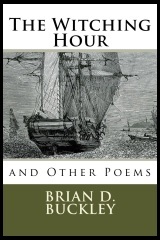 The light comes on approximately ten times a day. The warning light also causes the horn to honk. There is no way to turn off this feature. Your car’s garage is located on the second floor, right next to your bedroom, so that you don’t miss any of those delightful horn honks. You have to change the filter about every three hours. The car flails and wiggles the whole time you’re changing the filter. The car does not come with an owner’s manual. You can buy a third-party manual if you wish; there are about 50,000 to choose from, and they all offer conflicting information. You do not get a choice of color. If the car is an unexpected color, people get very upset. The car does not drive. At all. If you want to take the car somewhere, you must tow it using another vehicle. If you try to trade in the car for another, better functioning model, you will be arrested. The rumors are true. 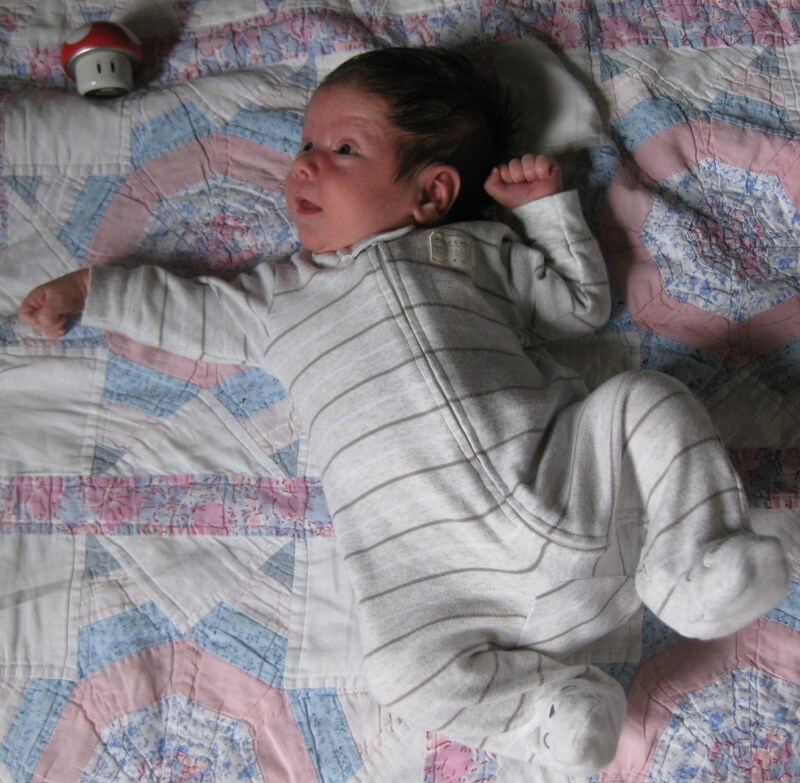 Evan Buckley came home from the hospital on September 24. He’s now two and a half weeks old. The lack of posts recently may or may not be related. 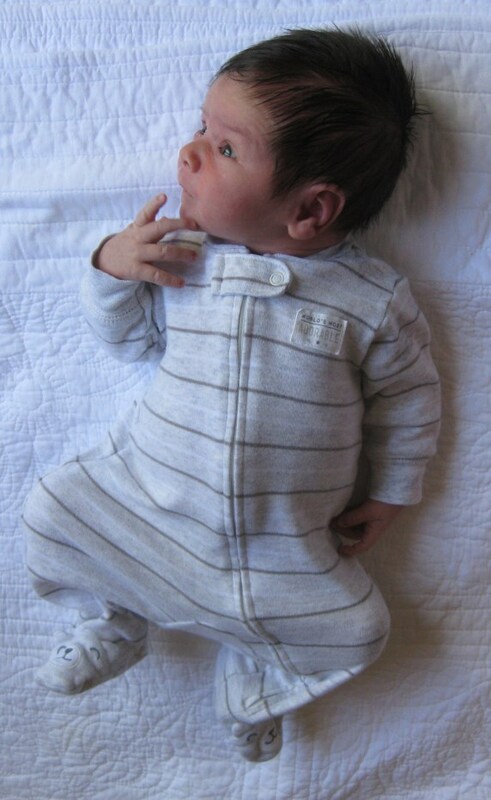 His onesie says “World’s Most Adorable,” but I know they mass-produce those. It’s like they’re not even trying to hide the lies. 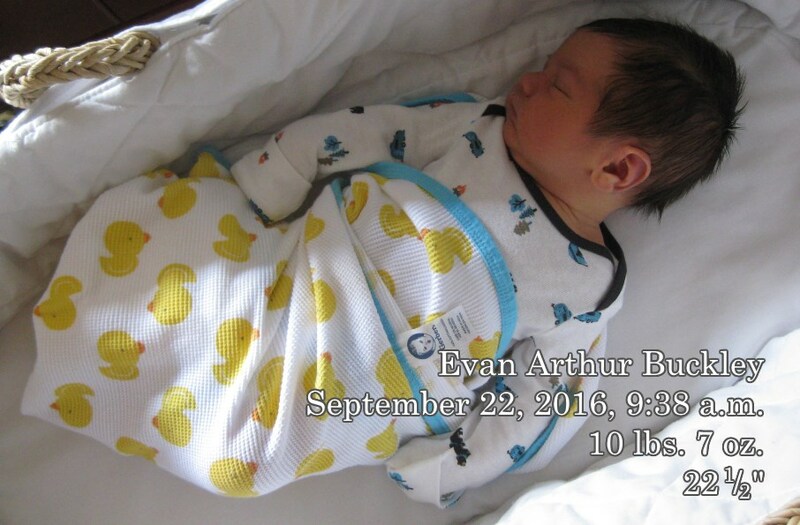 Of course, privately I know very well that Evan is the most adorable, but that’s a separate matter. I don’t understand baby reflexes. Crying, which is meant to elicit sympathy and affection, is among the top 25 most annoying sounds in the world. And the more hungry they get, the more likely they are to flail their arms and block your attempts to feed them. I mean, child. I know you’re new and all, but seriously. The facial expressions this baby makes. I can’t even describe them. He’s like a skeptical hippie on an acid trip. It is the absolute cutest thing. I’ve started reading him a book called “Animals,” which is part of the “Baby Touch and Feel” series (which is probably not the best name for a series, but hey). One of the pages has a photo of a baby chimp, with the words “Baby Monkey.” Chimps are apes, not monkeys. Guys, your book is like twenty words long and the pages are cardboard. You really couldn’t be bothered to fact-check? I once took an aptitude test that revealed – and this is true – I am in the bottom 5% of the population in finger dexterity. This has become painfully apparent as I attempt to change diapers and baby clothes. The snaps and zippers and tabs are bad enough in any case, but when they’re attached to a wriggling squirming infant in the dark while I’m on two hours of sleep, it starts to feel vaguely surreal. I’m getting better, though. I actually don’t mind changing diapers that much. I’m also doing okay on the less-sleep-than-normal schedule, although the first few days were rough. The hardest part so far is the fact that it just never stops. Every two to four hours is another feeding, another diaper change, another time he needs some encouragement to fall asleep. There’s no off switch. On the plus side, I love playing with him. 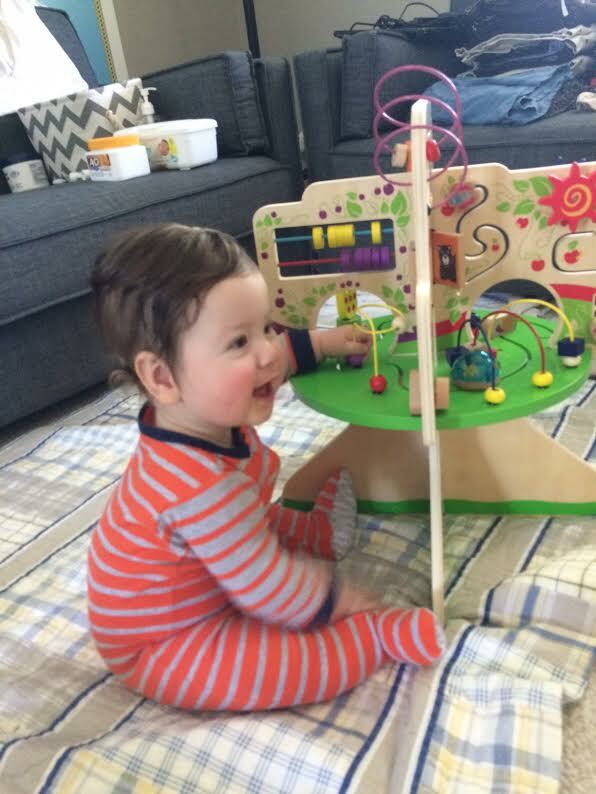 I mean, he doesn’t have much conscious muscle control, so “playing” is mostly talking to him and waving his hands around. But still. I got a flu shot the other day, the first time I’ve ever done so. My weird needle phobia causes me to get dizzy/nauseous when I get a vaccine or a blood draw, so I tend to only get what’s absolutely necessary. Well, with a baby in the house, the flu shot suddenly flew into the “necessary” camp. It was just as bad as usual, and definitely the most personal conversation I’ve ever had with a Walgreen’s employee, but hey. We do what we gotta. I love Evan so much. 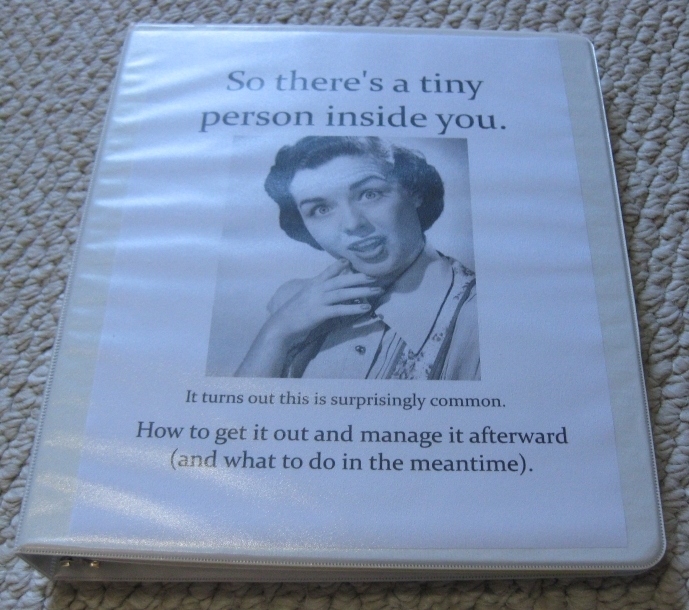 I made Betsy a binder for all the pregnancy papers, pamphlets, and forms we’ve accumulated over the past seven months. She’s so lucky to have me!